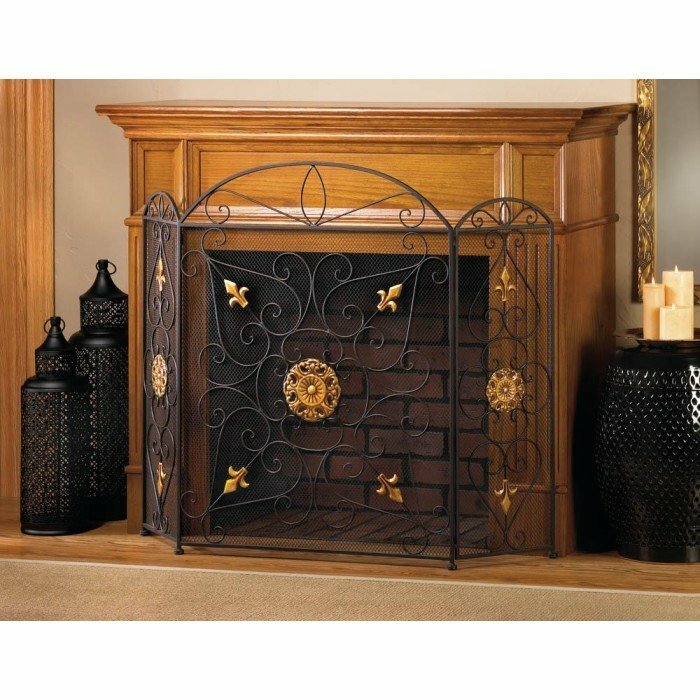 SPLENDOR FIREPLACE SCREEN by Accent Plus home decor, jewelry, decor, decorations, electronics, fountains, floor mats, art glass, vases, garden essentials, fireplace screens. Transform your fireplace into a showcase of elegant style with this luxurious fireplace screen. Made from black iron mesh and embellished with golden ornaments, the three-panel construction can be adjusted to fit your space perfectly. Center panel: 26" x 34 1/2" high; each side panel is 10 5/8" x 31 5/8" high. Material(s): IRON METAL - MESH METAL - SHEET. Weight 9.8 pounds. Dimensions 26" x 10.6" x 31.6".